Regarding J. W. Moore it was stated in the SGL Journal of Proceedings Annual Reports ..., Volume 2 that " J. W. Moore was sick at the time of the trial and had since died rendering a trial action unnecessary." This causes one to question if there may have been two J. W. Moore's. 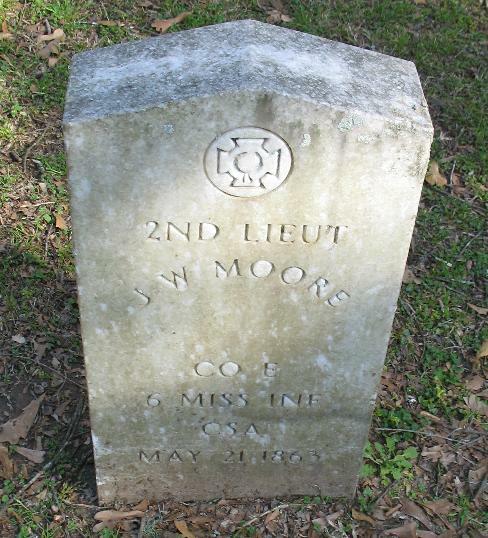 We know that John W. Moore (mentioned in 'NOTE' below) died in 1846. This may of been the J. W. Moore SGL was reporting on. Regardless of the point, we know that a J. W. Moore became Grand Master in 1853 and we have a record of his other activities subsequently. Many Odd Fellows think that John W. Moore and PGM J. W. Moore were the same person. This is not true because John W. Moore passed away before PGM J. W. Moore became Grand Master in 1853. However, they may have been kin to each other. They both were Odd Fellows. 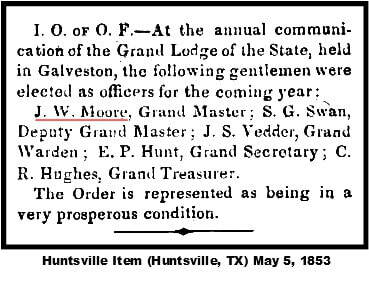 In fact John W. Moore was a charter member of the first Independent Order of Odd Fellows lodge of Texas, organized at Houston on July 25, 1838. For more information about John W. Moore look at this link or click to enlarge the tombstone at the top left. PGM J. W. Moore has been a mystery that requires much research. We believe he was the same James W. Moore who was the Clerk of the District Court of Galveston County, State of Texas in 1856. James W. Moore also became the president of the Howard Association in Galveston, Texas. This organization was concerned with health issues such as yellow fever in Galveston. He also was a secretary/officer for the Galveston Hooks and Ladder Company No.1 in 1843. 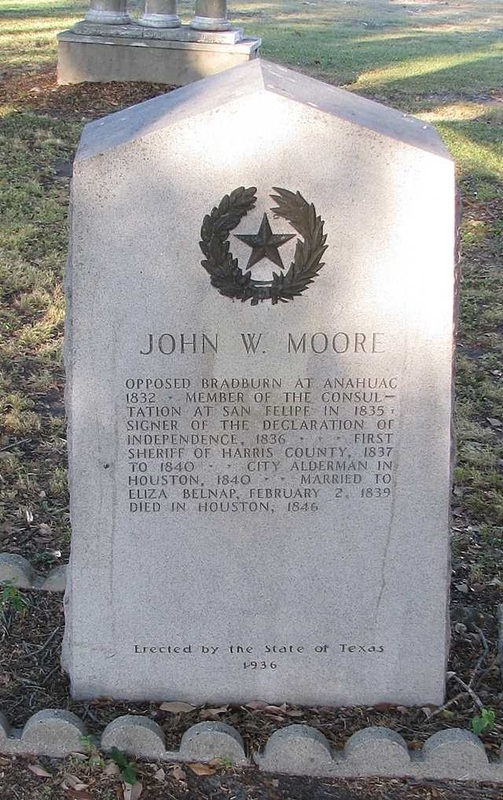 Moore had moved to Texas in 1839 he became the mayor pro tem of Galveston in 1861 and upon the permanent occupation of the city by the Union forces in 1862 he entered the Confederate army and served west of the Mississippi during the war. He died soon after with disease which was the result of exposure in the field. He died leaving several children in Texas according to some accounts. The last record of Moore being in service to the city of Galveston was in 1864 which is in conflict with the burial record below. Even though we are not for certain that the below J.W. Moore is the same PGM, it does not hurt to give him honor for his sacrifice.